Setting up a proper lighting and heating system is an extremely important part of keeping your turtle healthy. In the wild, turtles bask in the sun for 10-14 hours per day – when setting up a turtle tank, we want to do our best recreate their natural habitat. Obviously, a huge part of that is mimicking the sun’s natural UV rays and warmth. In this complete guide, we will discuss everything you need to know about turtle lights – including the importance of UVB rays, basking bulbs, and heating elements. This is your one-stop shop for everything turtle lighting! 2.1 Why is UVB Light Important? 7.1 How Many Hours per Day Should I Run My Lights? If you don’t know exactly what each bulb type labeled here means, don’t worry – we will discuss that later in this article. 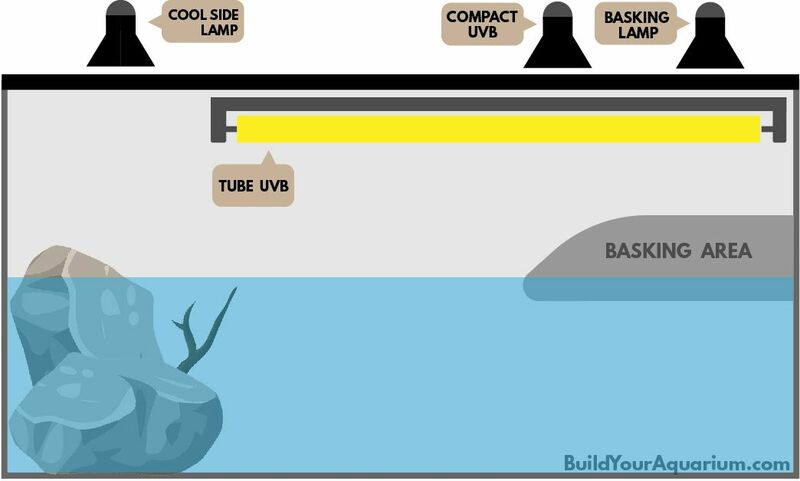 Note: You won’t need a tube UVB bulb and a compact UVB bulb. One or the other is perfectly fine. We’ve included both in the image above to show you where each type should be placed. Putting together a lighting setup for your turtle tank isn’t just for viewing purposes – light is actually vital to their health. Without the presence of certain light waves (UVB light), turtles can actually develop fatal diseases and deficiencies. 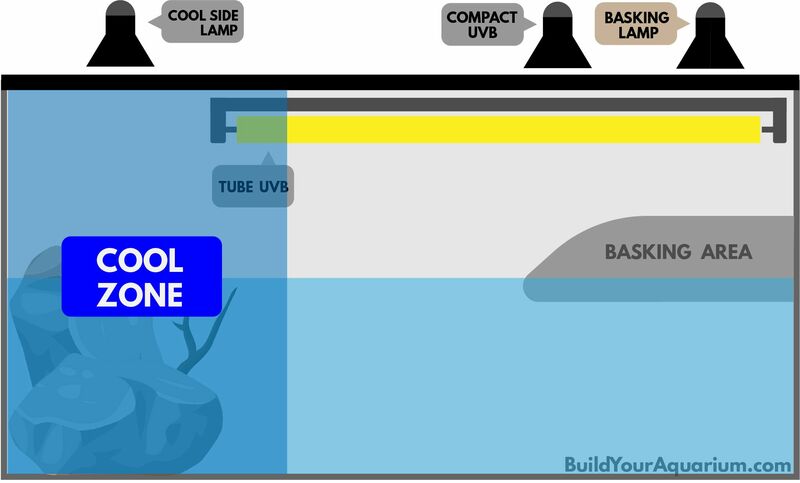 Here is everything you need to know about UVB lighting for turtle tanks (and our recommendations about which lamps you should use). 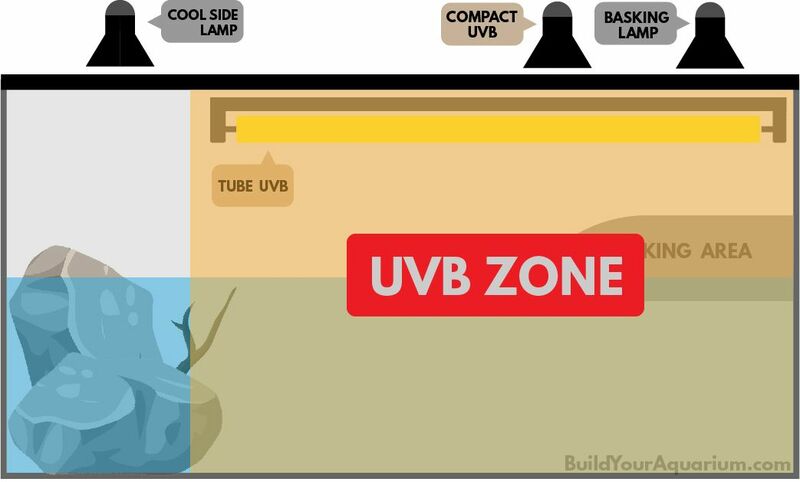 Why is UVB Light Important? UVB light falls in the 280-315 nanometer range, so for humans it’s invisible. For turtles, though, UVB light is a vital part of life. You should never skip the UVB light when setting up a turtle tank. Why exactly is UVB light so important? UVB light helps reptiles and amphibians regulate the synthesis of Vitamin D3. Vitamin D3 is vital to a turtle’s health because it allows animals to absorb and use calcium. Without some source of UVB light, turtles will eventually develop Metabolic Bone Disease. Metabolic Bone Disease is a painful (and often fatal) disease that causes deformities and other bone issues in reptiles/amphibians. Long story short, you definitely want to avoid MBD at all costs. 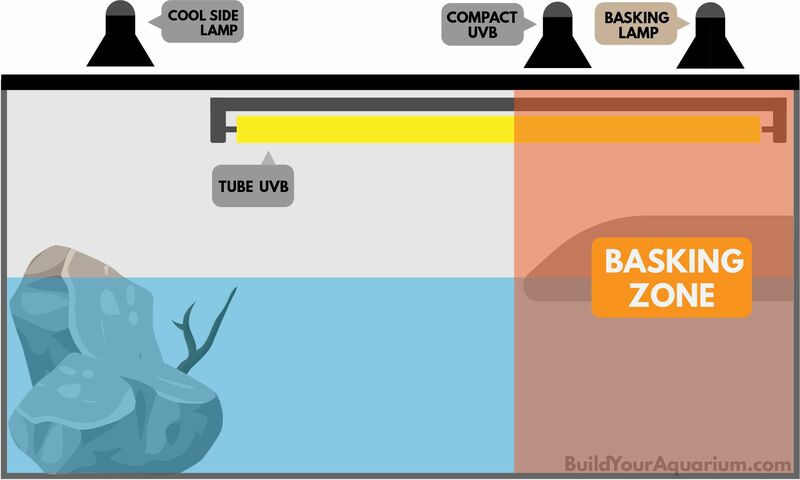 Luckily, it is not too difficult to avoid MBD – just make sure your turtle tank has some sort of UVB bulb. When it comes to UVB lighting, you have two main options – compact bulbs and tube bulbs (both with their own strengths and weaknesses). Lets start with compact bulbs. Compact UVB bulbs are an attractive choice because (as the name suggests) they’re, well…compact. The small structure of compact bulbs means they take up little room and makes them easy to install. In addition, they tend to be a bit cheaper than tube UVBs. Compact UVB bulbs come with their downsides, though. Some hobbyists claim that compact bulbs can eventually lead to the development of photo-kerato-conjunctivitis in turtles, an eye issue stemming from prolonged exposure to light. Tons of turtle owners use strictly compact bulbs with no issues, but there is a small risk involved. If you decide to go with a compact UVB light for your turtle, try not to use a mirror-like reflector (as this increases the chance of eye problems). Instead, use a reflector with a satin or white painted interior. 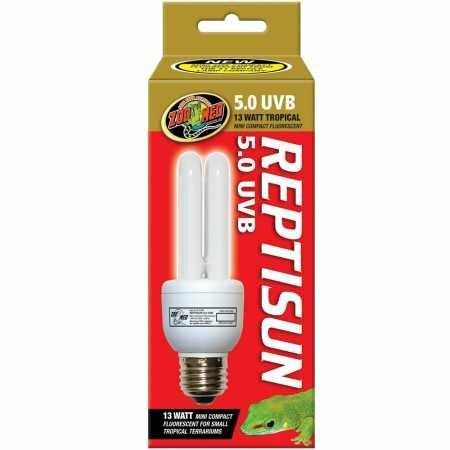 The ReptiSun 5.0 T5 UVB Tube Bulb is the perfect UVB light for any reptile. Trusted by thousands of reptile owners worldwide. 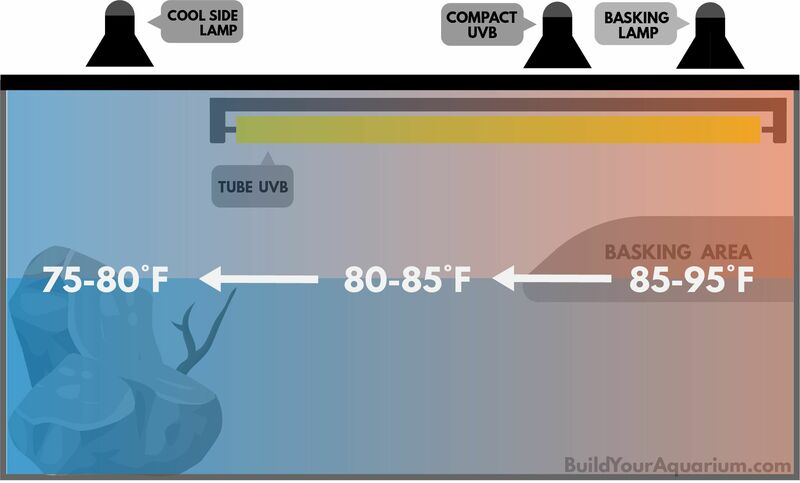 If you don’t mind spending a little extra money (and a little more setup time), tube UVB bulbs are definitely the way to go. They have been tried and tested over many years and don’t carry any risk of exposing your turtle to eye issues. The downside of tube UVB lamps is that they tend to be a little more expensive than compact bulbs – like we said, though, it’s best not to skimp when it comes to lighting. In addition, tube bulbs tend to be a little harder to mount as they require a T5 fixture mounted inside the tank. This really isn’t too tough (can be solved with a few 3M Command Hooks), but requires a little extra effort nonetheless. The last main downside to tube bulbs is that they don’t play well with above-tank basking areas since they’re generally mounted inside the tank. If you have an above tank basking area (such as the Penn Plax Turtle Topper), you might be better off with a compact bulb. When placing your UVB bulb, try to align it somewhere near the basking area. Since your turtle will most likely spend a lot of time basking, you want them soaking up some of those sweet UVB rays as well. If you’re UVB lamp is on the opposite side of the tank as your basking light, your turtle might not get all the UVB lighting that they need. As you can see from the image above, getting a good UVB spread with a tube light won’t be a problem. Try to get one that spans 2/3 to 3/4 the length of your tank. 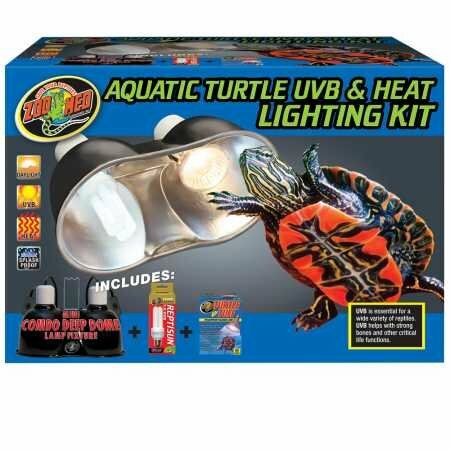 This will ensure that your turtle always has some sort of UVB exposure. A compact bulb require a little more specific placement, which is why we recommend placing it close to the basking area. As long as it’s somewhere near the basking area your turtle shouldn’t have any problems. One (unfortunate) thing about UVB bulbs is that they need to be replaced every 6 to 8 months. As UVB bulbs age, their spectrum gradually shifts out of the 280-315 nanometer range. So although a year old bulb may look perfectly fine to the naked eye, it actually isn’t delivering any of the vital light that turtles need to survive. It may seem a bit excessive to buy a new light every 6 months, but it’s just one of the necessary costs of owning a turtle. In the wild, turtles spend a lot of their time basking in the sun. When setting up a turtle tank, we want to encourage our turtles to bask as much as possible. A huge part of getting your turtle to bask is having a proper basking light setup. The basking area should generally sit between 90-95°F, while the ambient water temperature should hover around 75-80°F. A warm basking area allows turtles to regulate their body temperature based of their position in the tank. Luckily, choosing a turtle basking light isn’t quite as complicated as putting together a UVB setup. A simple halogen bulb in a dome lamp fixture should work perfectly fine. Also, when looking for a basking bulb, make sure you avoid any basking lamps that are “made specifically for reptiles”. They do the same exact thing as regular halogen bulbs, but cost 10x as much. The most important part of any basking bulb is its heat output – which leads us to a common question. How many watts should my basking bulb be? The answer is….it depends. Wattage isn’t really that important. What is important, though, is that the basking light delivers enough heat. As we discussed above, your basking platform’s temperature should measure between 90 and 95 degrees F.
For smaller tanks (or for those that position their light very close to the platform), 50 watts might be plenty. For larger turtle tanks, 100 watts may be necessary. A great way to adjust the temperature of your basking area is by raising/lowering the height at which your basking light sits. If the area is a little too hot, simply move your basking light a little higher. If it’s too cool, move the light a bit closer. Your basking light should ideally be placed all the way toowards one side of your tank (the side with the basking platform, of course). Doing so will help you create a temperature gradient, which we will explain a little further below. A temperature gradient allows your turtle to regulate its body temperature by changing locations in the tank. If it needs to warm up, you turtle can simply shift towards the right side of the basking platform. If your turtle needs to cool down, it can move to the left. By setting up a proper temperature gradient, you can help ensure that your turtle will always be comfortable in its habitat. Deep dome extends beyond the face of the lamp preventing the lamp from "sticking out"
A dual fixture, such as the Zoo Med Aquatic Turtle Lighting Kit shown above, is a great option because it eliminates the need for separate UVB and basking lamp fixtures. By combining your UVB and basking lamps into (virtually) the same beam of light, your turtle can soak up both heat and UVB rays at the same time. In addition, dual fixtures still allow you to keep each bulb of its own timer (which can be helpful if you want to turn on one lamp a few hours before the other). Side Note: I highly recommend picking up a timer to automate your entire light schedule. They’re cheap and you’ll no longer have to remember to turn your turtle’s lights on and off every day. Overall, dual lamps (such as the one shown above) are great all-in-one solutions to turtle lighting and are significantly easier than purchasing/hanging multiple fixtures. Giving your turtle somewhere to escape the heat of the basking lamp is important for thermoregulation. Much like in nature, captive turtle sometimes need to get out of the sun (or basking lamp)! Hence the need for a cool zone. Cool side lamps aren’t 100% necessary. In fact, most turtle owners probably don’t use a lamp on the “cool side” of their tank (the side opposite of the basking bulb). That being said, a cool side lamp can helpful if you have a large tank (or if your room is relatively dark). Since turtles need some sort of day/night schedule, a lamp on the cool side of your tank can help keep everything consistent (since you don’t want one side of your tank bright and the other dark). So what kind of lamp should you use for the cool side? Honestly, any household bulb that doesn’t produce too much heat should work just fine. If you notice that the cool side lamp is bumping up the temperate too high, try switching to an energy efficient bulb. We mentioned temperature gradients a few times earlier in the article. In case you missed it, a “temperature gradient” refers to the practice of arranging your light in a way such that temperatures shift smoothly from one side of the tank to the other. Creating a temperature gradient allows your turtle to pick a comfortable position in the tank based on its ideal body temperature. Basking Area: The basking area should sit somewhere between 90-95°F for most species of aquatic turtles. Older, more mature turtles sometime like it a bit cooler (85° or so). Water Temperature: The water temperate in your turtle setup should ideally sit around 78°F. This should be easy to dial in with an aquarium heater. Accurately measuring the temperature in your turtle setup is extremely important. I recommend picking up an infrared temperature gun to get accurate readings of the basking area. Like most animals, turtles prefer having some sort of set light cycle (aka they need a distinctive difference between day and night). This can be accomplished manually by switching on and off the lights at (generally) the same time every day. Too much variation can mess up their sleep and feeding schedule. The preferred method of setting up a light schedule is through the use of timers. Timers switch your light on and off every day automatically at the pre-set times (meaning you no longer have to do it yourself). They are also very useful if you travel or are out of the house a lot. 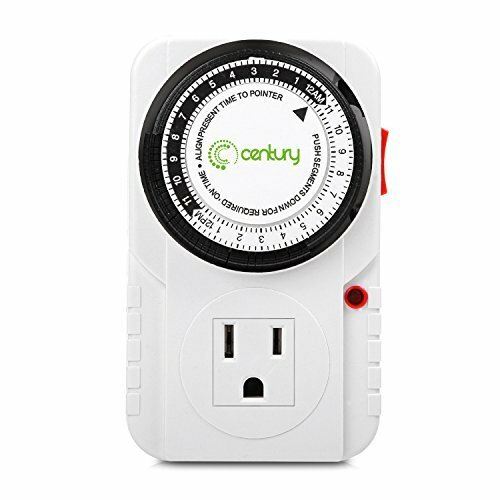 The Century Mechanical Timer helps automate you turtle's lighting schedule. Perfect for busy or traveling pet owners. How Many Hours per Day Should I Run My Lights? I recommend running your lights for 10-12 hours per day. At night, switch off all of your lights (meaning no sort of “night light” should be used). Your aquarium heater should keep the tank warm enough during the night without the need for any type of light. Any time that you’re combining water and electricity, certain precautions should be taken. Here are a few tips to keep you and your turtle safe. Mounting your light fixtures securely is extremely important (especially if you’re going with the tube bulb route). Make sure any hinges, hooks, or clamps are capable of supporting the weight of your light. If you notice that one of your lights has fallen, don’t reach your hand into the tank. Your first move should be unplugging any live wires. Remember how we said that excessive exposure to UVB light can damage your turtle’s eyes? The same thing can happen to humans. As a general rule, never look directly into your turtle’s lights. Make sure you unplug any and all wires before sticking your hand into the tank – even if you’re not messing with the lights in the first place. Electricity and water are the perfect combination for a bad accident. A basking bulb is also necessary and should be placed all the way towards one side of the turtle habitat (aka not in the middle of the tank). You should run your light for 10-12 hours per day. There we have it – everything you need to know about turtle lighting. If you have any questions regarding your turtle setup, feel free to send us an email! Good luck.